Trampolines are one of the best childhood activity, if not one of the best toddler gifts you can ever give your child - not only are they great fun, children get to build up their strength and reflexibility too by bouncing rhythmically on them. It is a great and healthy way to spend their time, as opposed to watching tv or playing games on their tablets, not to mention your little one will usually sleep better and faster at night after having had his/her energy drained out. Good news for the parents, eh? There are many different styles and shapes of trampolines available for sale in the market, but generally, they can be divided into two types - Above Ground and In Ground. As you can tell from its name, these trampolines sit on top of the ground and can be at both indoors and outdoors, just like what you'd most likely picture when you think of trampolines. We'd like to split this category into two types again - small trampoline and big trampoline. Yes yes, we know that is not much of a distinction, but perhaps the table below will give you a better understanding regarding the difference between the two (well, apart from their sizes), and hopefully that will help in making your decision which is the best trampoline to buy for your household. In ground trampoline, on the other hand, is placed in the ground which means you'll need to dig a hole to place it in. Naturally, this type of trampolines are meant for outdoor uses and they can come in different trampoline sizes. The main reason for parents choosing this type of trampoline is for safety purposes. 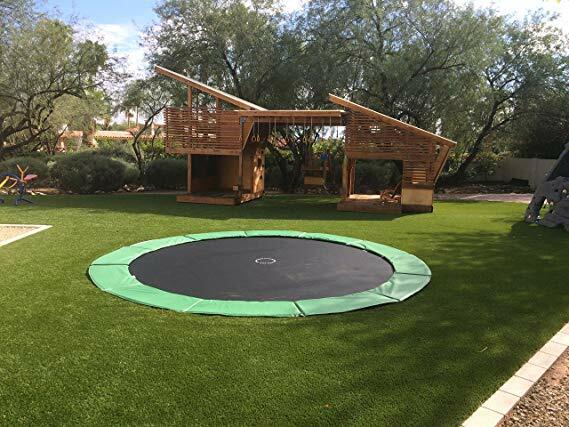 This is because ground trampoline is much more closer to the ground compare to above ground ones so in the event your child does fall off from the trampoline, the falling distance is reduced drastically. This in turn increases your child's safety. 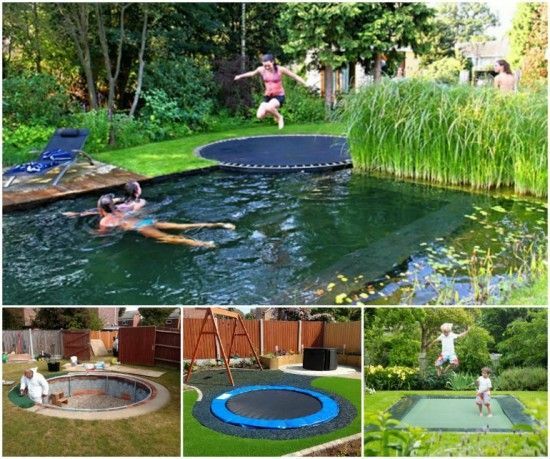 Of course, it is more aesthetically pleasing as well and makes for the best backyard trampoline because it blends into your landscape naturally, allowing you to even decorate the area by placing benches and flowers etc around it. However, the downside is that this type of trampoline prices are much, much more expensive than above ground trampolines, which probably explains why they are not as popular as their counterparts. Apart from that, it is also less flexible mobility-wise in that if you wish to move it elsewhere, you will need to dig up another hole, not to mention covering the previous pit again. Let us now move to our trampoline reviews to see what are some of the best trampoline for kids in each category. For indoor trampolines, you will notice that the ones we reviewed below does not come with a trampoline safety net because for most indoors, an enclosed trampoline will take up too much limited space. Also, you will note that they are generally smaller and less bouncy to avoid children bouncing too high up thus risking hurting their heads in the event they hit the ceiling. 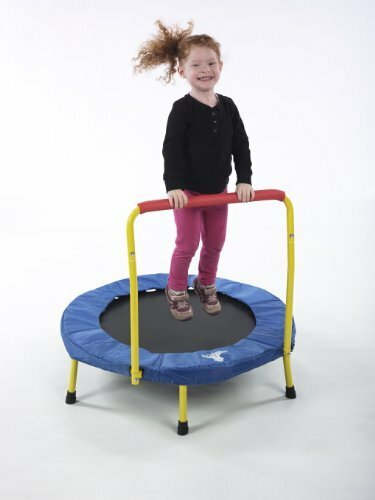 On the top of our list is The Original Toy Company Fold & Go Trampoline, a toddler trampoline from one of the best trampoline brands that has been trusted by many parents over the years. 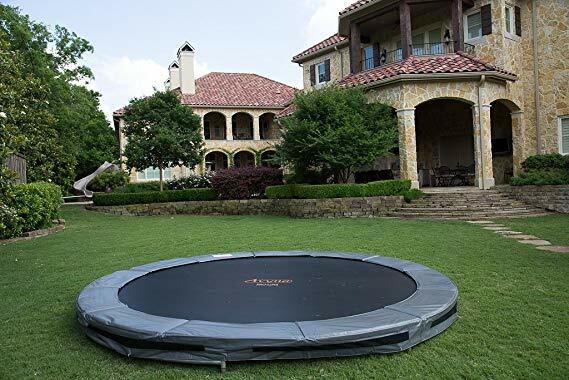 With a 36 inch diameter, this is one of the best home trampoline because it is not too big, not too small and has by far the biggest weight limit we can find in small trampolines like such - up to 150 pounds! This gives you a longer use-span unlike others which your little one may outgrow very soon. The reason we rate this number 1 is that the Fold & Go uses elastic straps instead of bungee cord attachments and metal springs. Why is this such a big deal? Well, most trampolines opt for the more common bungee cord attachments but these are not as heavy duty as elastic straps in that they tend to break after 9-12 months of use. With this one, you do not have to go hunt for trampoline replacement parts in a long, long while. As pictured left, the Fold & Go can be disassembled and packed up compactly for travel or storage, which is always a good idea because for an indoor trampoline, you do not want it to be laying around taking up valuable floorspace when not in use. To set up, simply unfold, screw on the legs, attach the handle and it is good to go. Another stand-out feature is that it has 6 instead of the usual 4 legs which makes it one of the best trampoline in terms of stability and safety. If you want extra safety, a circular trampoline mat attaches with ease to it and the surface is of the right firmness that prevents kids from jumping too high, yet still has a great bouncy effect. One thing to note is that the back legs tend to lift off slightly from the ground when heavier kids jump on it because of the increased pressure they put on the handlebar. However, it does not go to the extent that you need to fear about it tipping over, although you should always adhere to the weight limitation to keep things safe. 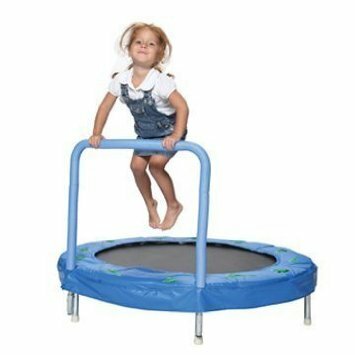 At under $100, The Original Toy Company Fold & Go Trampoline is one heavy duty trampoline (for its size) that we'd highly recommend to those who are looking for an excellent indoor trampoline. Coming very close in second is the Bazoongi 48"Bouncer Trampoline with Handlebar that is 12" wider than the Fold & Go, which makes it ideal for both indoor and outdoor fun play. Even though it is bigger in size, it does not have the same weight limitation as the Fold & Go in that it can accommodate up to 100 pounds max. Nonetheless, the Bazoongi also has 6 instead of 4 legs for extra stability that are made of rust-resistant, galvanized steel frame so you don't have to worry it being outdoor exposed to rainwater or the like. The reason we rate it second is because it uses galvanized springs instead of elastic straps, the former which will require replacing after 9-12 months of heavy use. Also, it produces a gap where the metal spring lies and if your little one's foot fall into it, it may hurt quite a bit. Apart from that, we find that this is one toddler trampoline that is well made and sturdy. The oversized frame pad includes mounting straps to secure the trampoline mat and the handlebar that is adjustable into 2 different heights is fully foam-padded all the way down, rather than just the top part. Cheaper than the Fold & Go, the Bazoongi 48" Bouncer Trampoline with Handlebar is one of the best trampoline to buy as the first trampoline for your children. If you experience a little lifting of the back legs when your child grows heavier, we recommend using sand bags or rocks to secure it further. 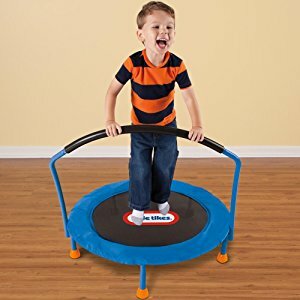 In terms of the best value trampoline, the Little Tike 3' Trampoline no doubt takes the crown with its under $60 price tag. Measuring at 3 ft, this trampoline weighs 15 pounds only so it is very easy to move it around the house. Sufficient jumping surface for 1, it uses elastic straps that we love as opposed to springs which can be less reliable over time. As with small trampolines of this type without enclosures, the back legs do lift off slightly from the ground if your little one press too hard on the handlebar so if you start noticing that, you may wish to put some dumbbells or sandbags at the legs to secure it. It doesn't mean this problem is bigger than the more expensive trampolines though, as its smaller weight limitation of up to 55 pounds max only means that the problem of heavier kids that cause such issue is comparatively lower. If you look carefully, the handlebar is far wider than the others which is something we love as well. It is very easy to assemble and if you find the bouncing surface a tad too firm in the beginning, don't worry, it will get more flexible after a few more uses. 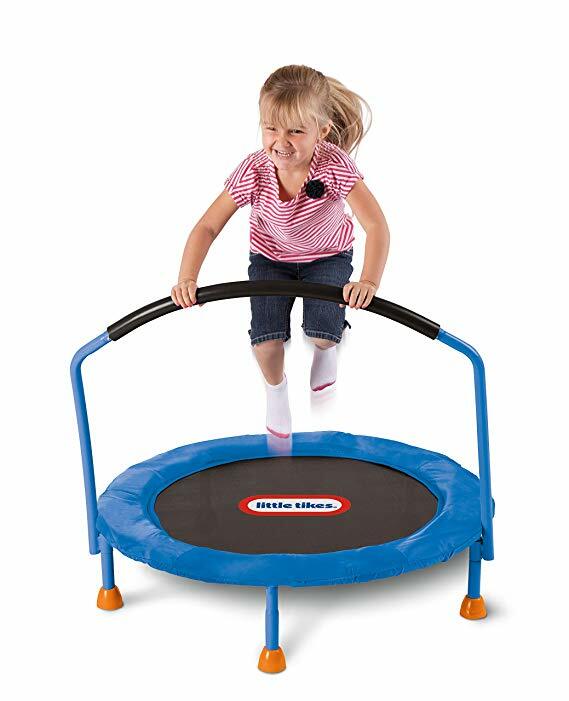 The Little Tikes 3' Trampoline is by far the best cheap trampoline that we can find in the market that does not compromise on quality. Please adhere to its instruction that it is to be used indoors only because it may not sit as securely on outdoor uneven grounds. For outdoor trampoline, depending on your backyard/garden space, it can be much larger compare to the indoor ones. It can also be much taller (there is a 18 ft trampoline even) which is why it is the type of toddler trampoline with net to keep your children safe bouncing inside. A heads up here, don't get bewildered thinking this is a skywalker trampoline reviews only because of the frequency their products are mentioned here - it's just that it is one of the best trampoline brands to buy from because the trampolines they produced are truly next level. Coming from one of the best trampoline brand that specialises in just one product - yep, trampolines - the Skywalker Trampolines 60" Round Seaside Adventure is one of its bestselling product out of all. At 60", the Seaside Adventure is just the right size for most families' home. If you'd prefer something smaller, there is a 48" available as well which basically shares the same features. What we really like is how it has a 360-degree padded handlebar that provides extra support for new jumpers by helping them stabilize as they jump. Even the enclosure poles are all foam padded and placed away from the enclosure net for safety while jumping. Instead of trampoline springs, it uses 36 stretch bands to eliminate any pinch hazard, in addition to added protection to give you peace of mind. A trampoline net is tightly woven and sewn directly to the jump mat so there is no dangerous gaps where your child's feet may get trapped into. Taking safety to the next level, another enclosure net is provided on the bottom part of the frame to keep kids and loose items from getting under the trampoline, making it safer for both the jumper and those around the trampoline. A wide frame pad covers the frame and all stretch bands, keeping kids safe even while they are not jumping. 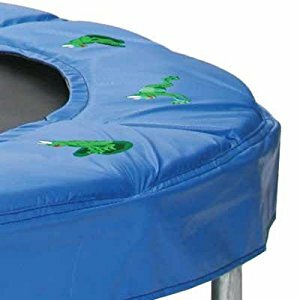 ASTM approved and under $80, we do not have much to fault the Skywalker Trampoline 60" Round Seaside Adventure - even its jump mat is made of polypropylene and woven to prevent slipping, and a zippered entrance is used instead of the annoying Velcro ones. If there is one thing we have to say, it is that the trampoline cover colour does fade off over time but that is unavoidable given it is exposed to the sun daily. It still works perfectly fine, so no big damage is made. One of the best trampoline games of all time is no doubt trampoline basketball and this 12ft trampoline - the Jump N' Dunk Trampoline with Basketball Hoop from Skywalkers Trampolines is the best trampoline with basketball hoop amongst all. 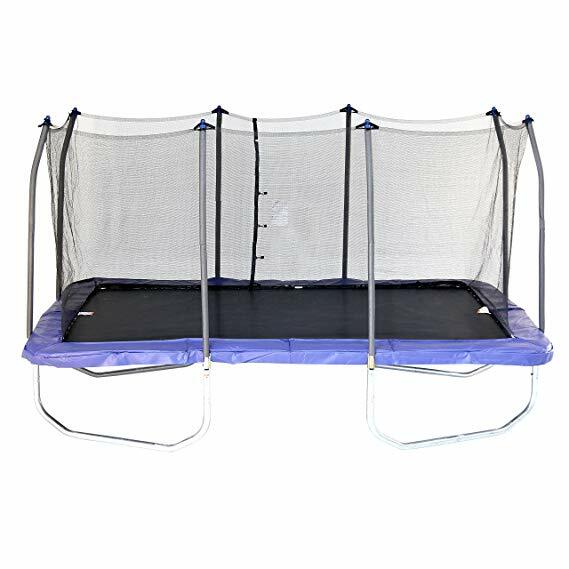 As one of the brand's biggest trampoline, it is a bit pricier but nothing like the fancier brands so it is still very affordable by many. It incorporates all the safety features that the brand is known for, including its patented no-gap enclosure design that eliminates dangerous gaps between the enclosure net and the jump surface. 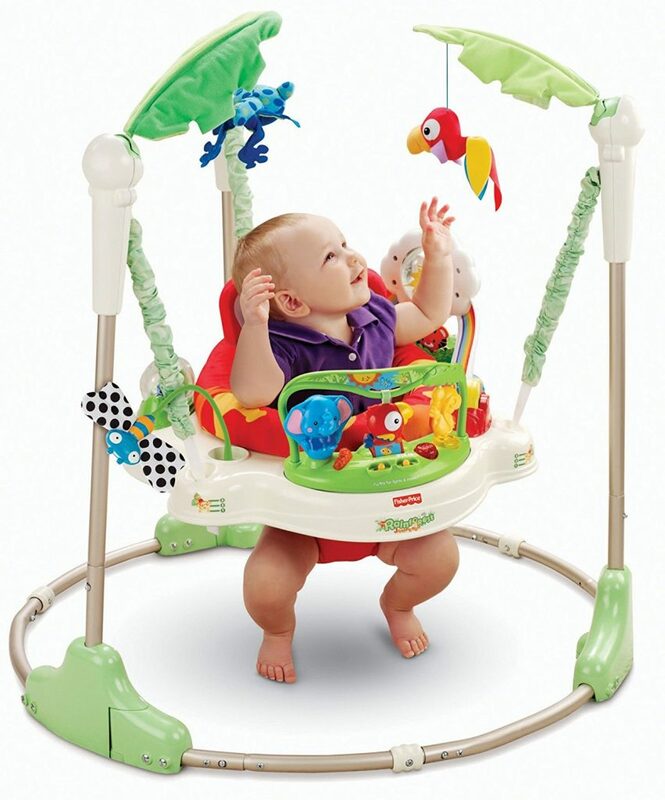 By attaching the net at each spring, kids are safe from hazardous pinch points and openings. As with all Skywalker Trampolines frames, the Jump N' Dunk has reinforced T-sockets at the leg and enclosure joint too to increase its stability and to prevent structural twisting. Because of its size, it uses 72 tightly-coiled springs around the outside of the enclosure net for added safety. Both these trampoline parts are made of rust-resistant galvanized steel with coating to extend the life of your trampoline. 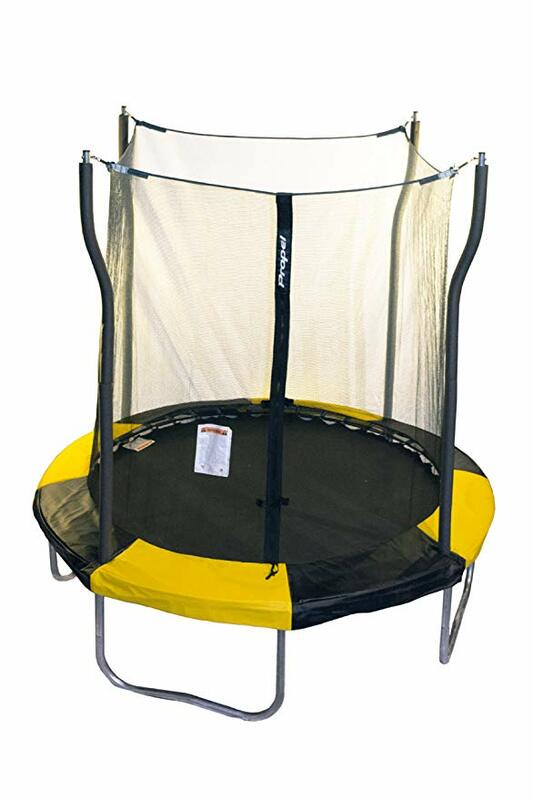 This trampoline with enclosure features upright foam padded poles for added stability. Each pole is angled at the top to keep the enclosure net away from the poles for added safety while jumping, and is topped with a pole cap for secure net attachment. 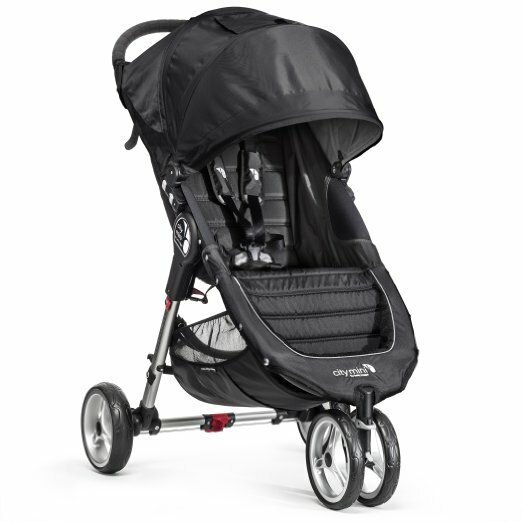 What's also worth mentioning is that it features a dual zipper and latch clip closure system. This means it can be opened from both inside and outside aside from keeping your kids safely inside the enclosure system while jumping. One extra accessory that people usually buy together is the brand's trampoline ladder to make things easier for shorter kids. And oh, make sure you purchase from an authorized retailer (this is one of the best place to buy a trampoline with peace of mind) to get the manufacturer's warranty - it exceeds those of top competitors, you wouldn't want to miss out! We know many of you are looking for a rectangle trampoline which is why we have found the best rectangle trampoline for you - the Skywalker Trampoline 15' Rectangle Trampoline with Enclosure. 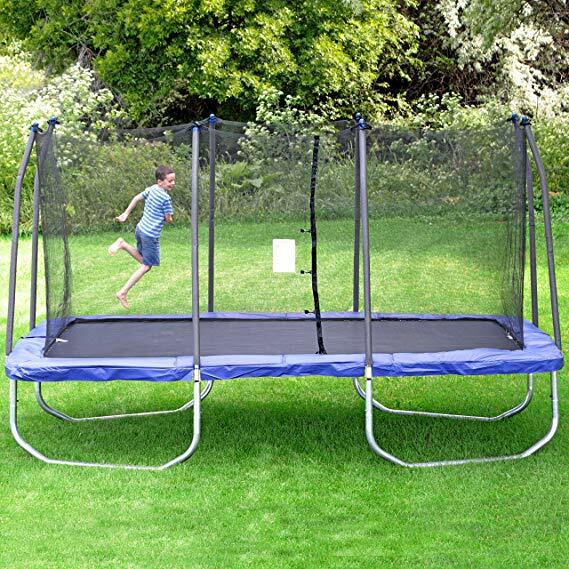 As evident by its name, this is a rectangle trampoline with net that measures at 15 ft with long straight sides. If you do not already know, rectangle trampoline gives the highest lift compare to the traditional round or oval trampoline. This is because the springs work at different rates to give the jumper more control over their height and landing. You may read more about rectangle trampolines here. Back to this skywalker rectangle trampoline. It has a galvanized steel frame and the enclosure frame interlocks with the trampoline frame using T-sockets at each frame joint to prevent structural twisting. 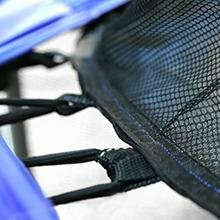 The enclosure netting interlocks with the jump mat at each v-ring using a button-hole feature which eliminates gaps with no ropes to thread. The jump mat is made of UV protected polypropylene and is woven to prevent slipping, while the extra thick vinyl-coated spring pad is fade resistant. In fact, all materials are made to be durable and long lasting and UV resistant to give years of outdoor enjoyment. One of the best 15 foot trampoline in the market, and in the rectangle shape that many of you desire, we have to warn you that the Skywalker Trampoline 15' Rectangle Trampoline with Enclosure does not come cheap. However, for its quality and considering it comes from a well-known and loved brand, we think its price is reasonable. It truly last you a long time without much fading so you know it won't become an eyesore at your backyard after just a short while. The newest release in 2018 by Kangaroo Hoppers - the 15ft Round Trampoline with Enclosure Net and Ladder is one that comes with all the trampoline accessories you would ever need, including a trampoline ladder! Yes, all these and at such a size that is under $300 so we'd say this is one of the best trampoline deals you'd ever find in the market. If you've never heard of the brand, it is actually a professional manufacturer of both indoor and outdoor trampolines with innovative safety design. All their products are thoroughly tested by TUV and ASTM so don't think this is some random trampoline with no credentials based on its great price/value. It is very easy to assemble this trampoline with no drilling required. The frame uses fully galvanized steel for better resistance against rust and corrosion and the enclosure system has upright foam padded poles for added stability. Each pole is topped with a pole cap for secure net attachment, speaking of which is made of superior dense mesh and a wide spring cover pad with an overhand fully covers the frame neatly. The unique curvy legs design gives better stability and safety so that it can accommodate up to 250 pounds, in other words, long lifespan! Although bouncing-wise not as good as the skywalker trampoline rectangle, the wear-resistant and high density, anti-UV jumping mat does stand up to high pressure to give a steady bounce. Each long spring is made of steel and features a rust-resistant coating for a longer life. 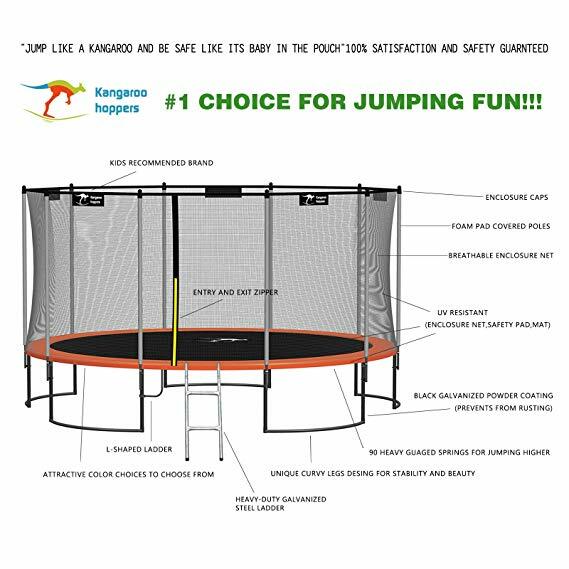 We'd say the Kangaroo Hoppers 15ft Round Trampoline with Enclosure Net and Ladder is one of the best value for money trampoline. All trampoline parts are made of high quality materials and even the trampoline ladder that is included is made of heavy duty galvanised steel. With a 1-year limited warranty, this is the best quality trampoline that we'd recommend if you do not want to be spending too much money on one. 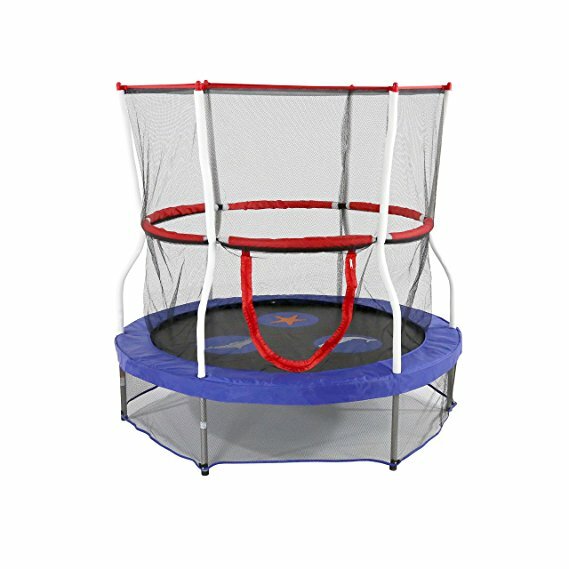 There are many propel trampoline reviews out there so perhaps this is not a brand you're unfamiliar with if you've been on the hunt for a trampoline and had been doing your research, but out of all the models they have, we like the Indoor/Outdoor 7ft Round Trampoline with Enclosure best. 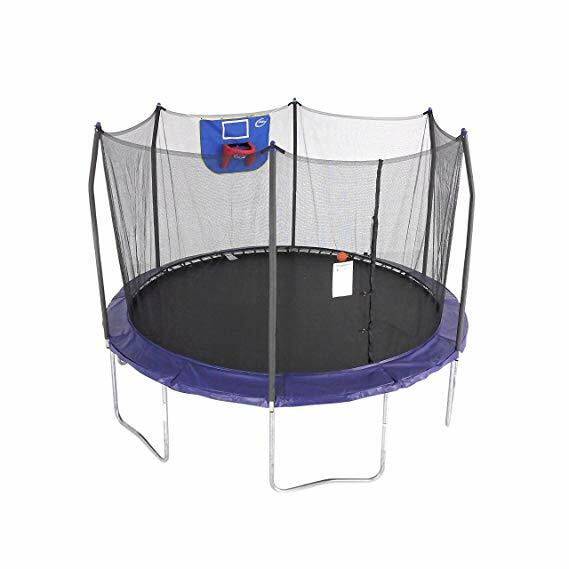 A trampoline with net, this 7ft kids trampoline has a weight capacity of 150 pounds so you can be sure your little one gets long uses out of it. It has an ultra-smooth bounce that is controlled by 40 galvanized steel springs, in fact, its bounce is by far the smoothest we have tested in the market so far. 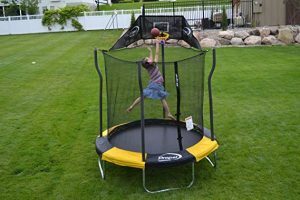 This Propel Trampoline comes with a free Jump-N-Jam basketball hoop system with basketball too so your child can carry out his trampoline workout safely in the enclosure setting. It has an impact-absorbent enclosure system and thick Sure-Lock frame pad to give the ultimate safety. For better stability, it uses an advanced T-bracket system to prevent the frame from twisting and the T-brackets lock into the 4 strong legs impact-absorbent response safety enclosure system. 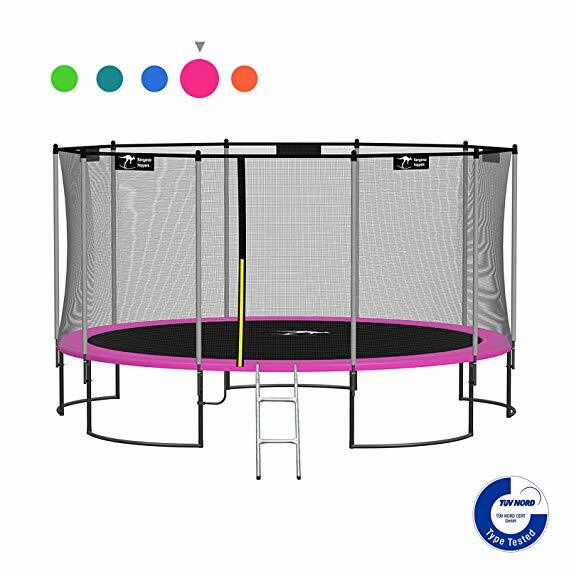 As it has a smaller frame compare to the others in this category, the Propel Trampolines Indoor/Outdoor 7ft Round Trampoline with Enclosure can be placed indoors if you have the space. We'd recommend leaving it outdoors though if your little one will be playing basketball in it often because with all the jumping and dunking involved, it is best that there is no ceiling (no matter how high up it is) that caps off their actions. Last on our best trampoline reviews is the in ground category and as mentioned above, this is the most expensive type of trampoline that can easily set you back $1,000 or more. Nevertheless, they make for the best trampoline for adults too if not the best outdoor trampoline for gymnastics due to their generous size. 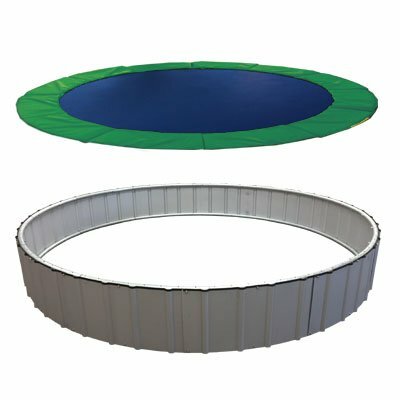 For those that are interested, here are the top 2 best in ground trampoline that we'd recommend. The creme de la creme of trampolines - the 12' and 15' In-Ground Trampoline Systems are by far the finest in ground trampolines ever built using the very best materials available and is the only trampoline in the world specifically designed and engineered to go into the ground. Unlike other in-ground systems, this is not a converted above ground trampoline. Common concerns such as airflow, corrosion and water collection in the pit have all been addressed in this one-of-a-kind design. Its all-new, super heavy-duty frame is constructed from 14 gauge steel tubing and is supported by 18 gauge steel wall panels. You do not have to worry about underground water corrosion problem because all the steel material is galvanized for maximum corrosion resistance. Further, all this steel is fastened together with stainless steel hardware because it is meant for permanence and long-term use. This new version now comes with an even easier installation procedure that requires less excavation and dirt haul-away. And, its new maximum airflow jump surface allows 20X better airflow than conventional jump surface materials available on the market. Apart from that, the In-Ground Trampoline IGT Systems have the highest spring count in the industry all with pre-galvanized, tapered springs for a deep, soft, high performance bounce. 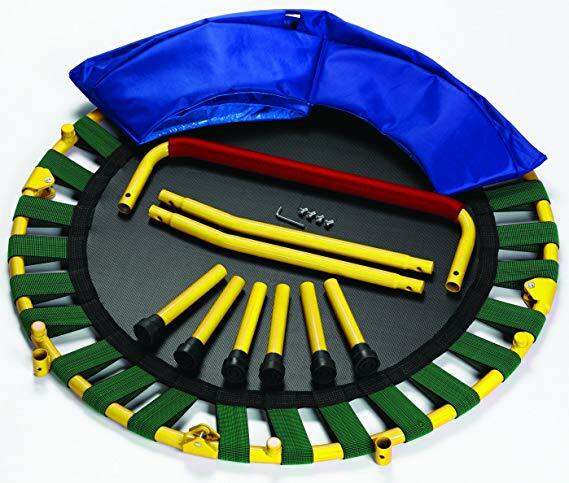 You get further unrivaled performance with the redesigned pads that are now attached to the frame using a unique bungee system that offers flexibility to decrease stress on the seams and ensures the pad stays in its proper position over the frame, which is why it is regarded as one of the best exercise trampoline by many. Designed, engineered and fully American-made, the In-Ground Trampolines Stainless Steel Upgrade retails over $1,000, close to $2,000 in fact. It is not for everyone, but if you'd foresee a lot of use in the future from both yourselves as parents and all your children, then we'd say go for it if you can afford it because first of all, it gives unrivaled performance and quality and secondly, this will truly last you a lifetime. Plus, the brand offers a complete and comprehensive warranty on every component of their product. When you take all these into consideration, it doesn't sound so ridiculously expensive anymore, do it? 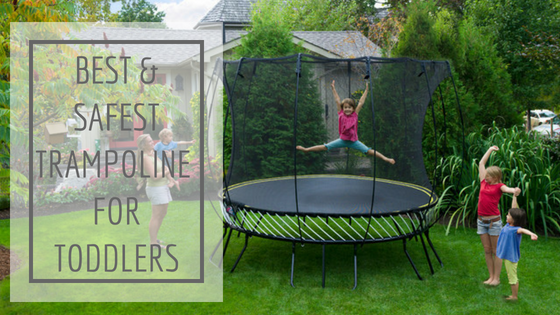 For a slightly cheaper alternative (albeit slightly only), the Avyna Pro-Line In-Ground Trampoline is another best family trampoline to have in your garden. 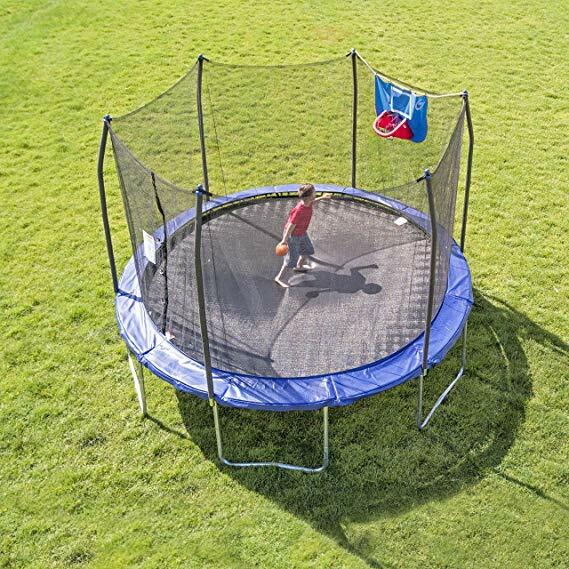 With over 25 years of manufacturing outdoor sporting goods industry, this 14ft trampoline is just a step above the lawn instead of 3-feet above ground so you don't have to fear that your children will fall off high above ground trampolines, thereby effectively eliminating the need for a safety enclosure net. The low profile design beautifies your backyard garden appearance too and Avyna's unique in-ground design provides a sitting area for jumpers. Its unique design reduces soil excavation to only 3 cubic yards so you can install it yourself without the use of professionals, though we'd highly recommend that you check out this video before excavation and assembly to ensure a proper setup. We're sorry that there isn't really a price-friendly and high quality in ground trampoline in the market - the closest you'd get is the Avyna Pro-Line In-Ground Trampoline that is slightly over $1000. Again, we'd recommend getting one if you foresee there will be a lot of use over the many years ahead, otherwise, it wouldn't be worthwhile to get one. Nonetheless, we have to say it is a steal for childcares/kindergartens or generally a family home with many children because the high quality will be able to withstand the many uses (rough ones even) it will get, and it comes with an exclusive LIFETIME guarantee.